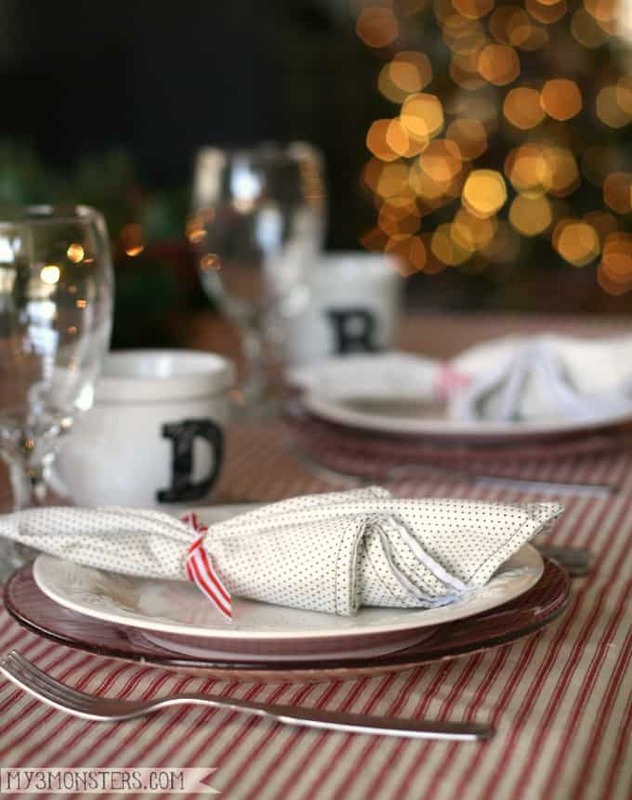 Create these unique holiday plates your guests will love – use clear glass plates from the dollar store, fabric, and Mod Podge. Hi guys! I'm Amy from My 3 Monsters and I'm thrilled to be here today. 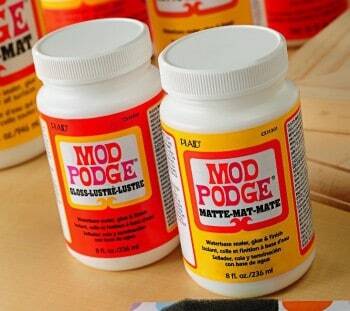 Mod Podge is one of my all-time favorite decoupage mediums. There is NO END to what it can do! Seriously, y'all — on my blog I have used it to make over everything from dressy shoes to a drink cooler. 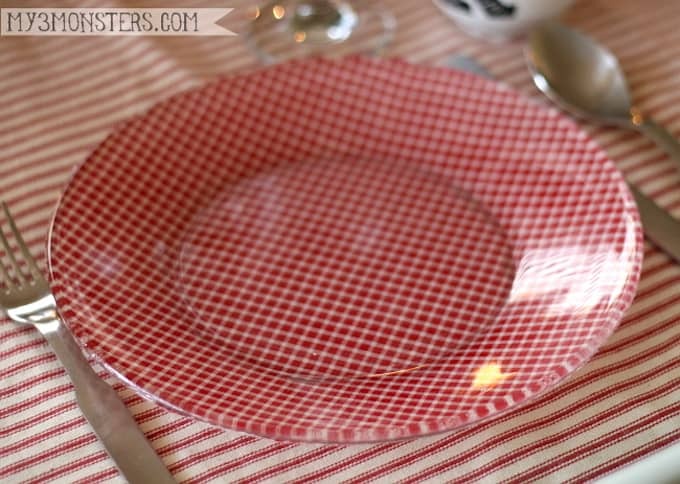 This holiday season I really wanted some red plaid dinner plates to pair with the white embossed snowflake salad plates I use every year. The only problem is . 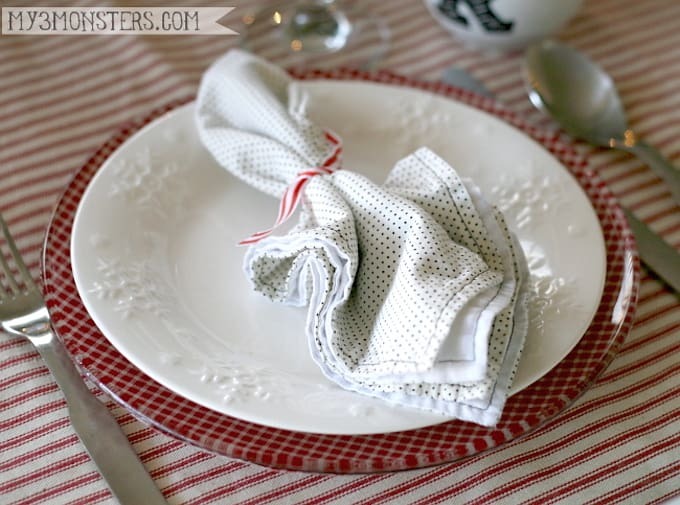 . . you can't just up-and-buy red plaid plates anywhere. At least not the kind I was dreaming of, or in my budget. Undaunted, I decided to make my own out of clear glass plates that are available at most dollar stores. 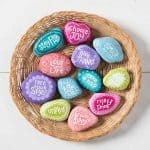 *Note: this post was originally published in December 2014, before Dishwasher Safe Mod Podge existed. 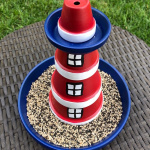 Dishwasher Safe is what you would want to use in place of Outdoor Mod Podge for this project. 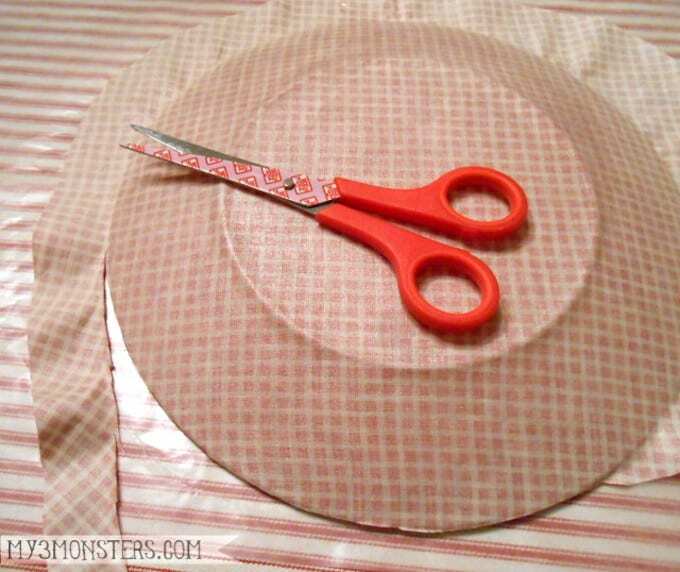 Step 1: Lay one of your plates upside down on top of your fabric. Using a pencil or chalk, draw a circle about 1″ wider than the plate all the way around. Cut out the fabric circle. 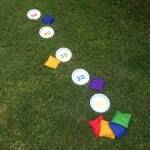 You will need one circle for each plate. I was able to get 8 10″ plates out of 1 yard of fabric. 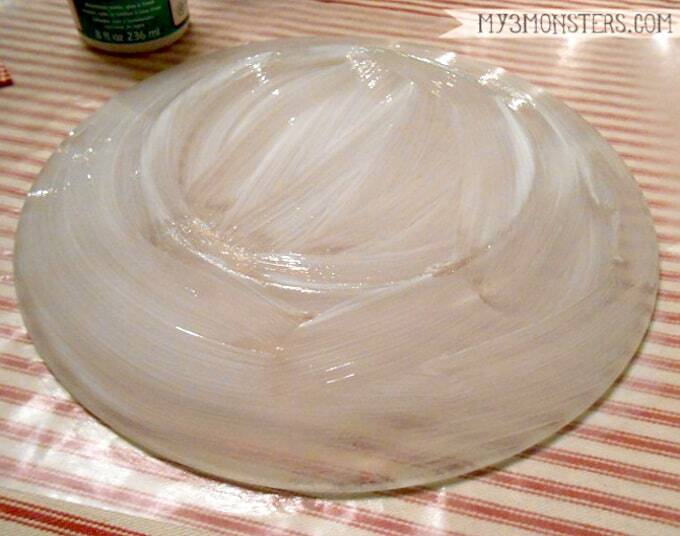 Step 2: Lay a plate upside down on a sheet of wax paper. 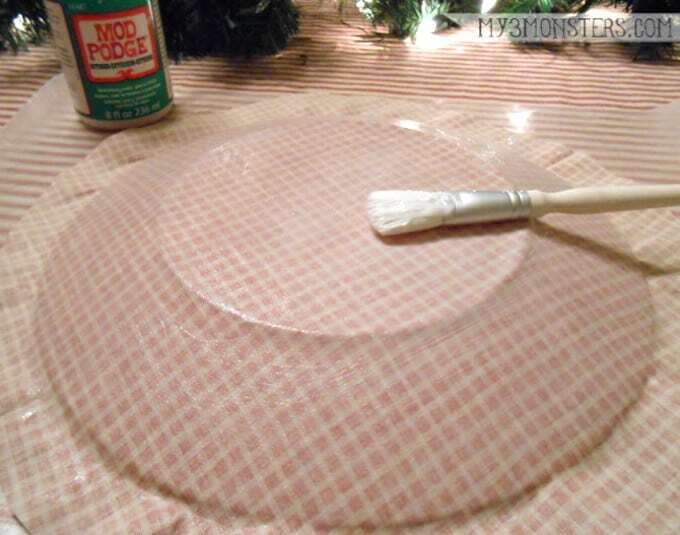 Clean it well with glass cleaner and paper towels to remove any fingerprints from the glass, then paint a good, even coat of the Outdoor Mod Podge all over the back of the plate. Step 3: Place a fabric circle right-side-down on top of the plate and gently smooth it out to cover the plate and remove any creases. 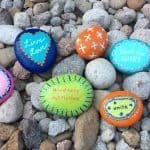 Fabric is awesome for this project because it has a little bit of “give” so you can gently pull and stretch it a tiny bit to make it cover a rounded surface without creasing. Using a “squeegee” type tool or a credit card, gently rub the entire surface to remove any air bubbles and make sure everything is stuck tight to the glass. You can pick up the plate at this point to see how it looks from the front and make adjustments if necessary. 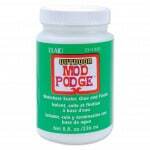 Just remember that any white streaks of Mod Podge you see will dry clear. Step 4: Paint a light, even coat of the Outdoor Mod Podge over the entire back surface of the plate and allow to dry. Step 5: Using very sharp scissors or an X-Acto knife, cut away the excess fabric around the edge of the plate as close to the edge as possible. Paint 4-5 more light coats of Mod Podge onto the back of the plate, allowing it to dry 15-20 minutes in between coats. Wait at least 72 hours before using the plates to allow the Mod Podge to set up completely. 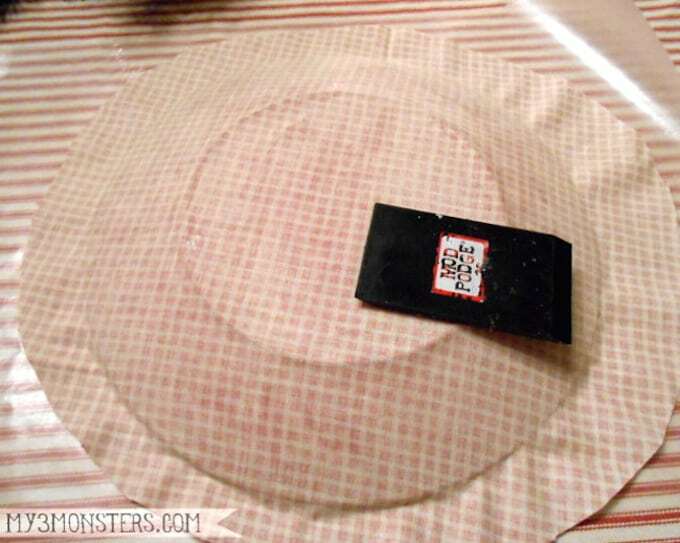 You will be able to eat off the plates since all the Mod Podge is on the back. To clean, hand wash them gently and avoid soaking them in water. Just rinse and scrub the front clean quickly, then lay upside down to dry. These are definitely not every-day plates that you can throw in the dishwasher, but for special occasions like Christmas dinner I think they're just perfect! If you don't feel like making a whole set of dishes, your kiddos could help you make a special cookie plate for Santa. They are exactly what I was hoping for! 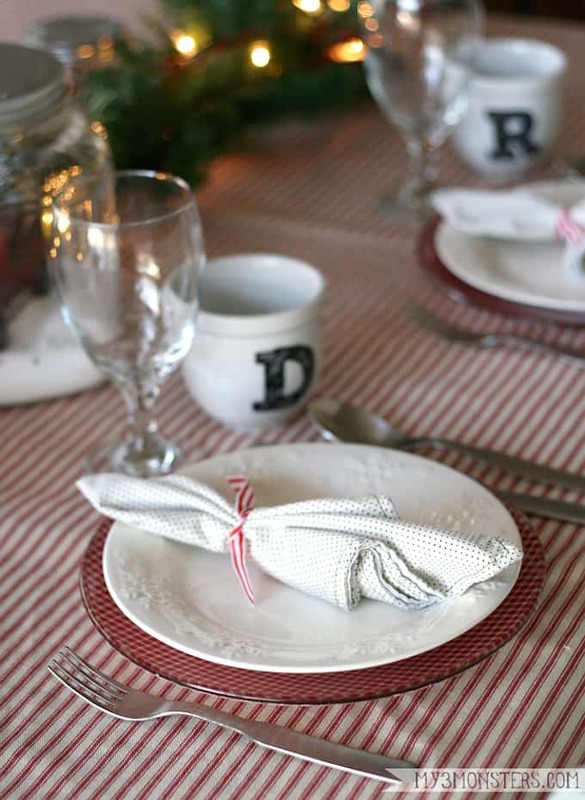 Just a little pop of red and another fun layer of pattern in the mix for an interesting holiday table. With a woodsy lighted garland down the center of the table and the Christmas tree glowing in the next room, you'll have the warm and cozy effect of dinner by candlelight come Christmas Eve! For more crafting, decorating, and baking ideas, visit My 3 Monsters on Instagram, Facebook, Twitter, Bloglovin', and Pinterest. This is so awesome! Definitely want to try this!